Accessories: Accompanied by original guarantee certificate, COSC certificate dated 8 March 1961, original sales receipt dated 11 August 1961, Rolex inner and outer presentation boxes, and original crystal. The Rolex GMT-Master’s fascinating history began with Pan American Airways’ collaboration with Rolex to develop a watch that would allow their pilots to simultaneously keep track of time in two time zones. Reference 1675 was introduced in 1960 as the successor to the reference 6542 – the first GMT-Master launched in 1954. The reference 1675 introduced crown guards and a bezel with a metallic insert that was more robust than the 6542’s Bakelite bezel, notorious for its fragility even today among the collecting community. The present example displays many of the desirable traits of an early iteration of the reference 1675 GMT-Master: a small arrow tipped 24-hour hand, glossy lacquer dial, and gilt printing. It is further complemented by its original guarantee, COSC certificate, and sales receipt indicating it was sold in 1961 for 108.80 Deutsche marks. Thick luminous hour plots that have aged to a pleasing light beige match the pale gold gilt printing still visible on the dial, while the red and blue metallic insert has faded to create an ombré-effect where the portion of the insert closest to the dial is slightly more vibrant than the portion further away from the dial. 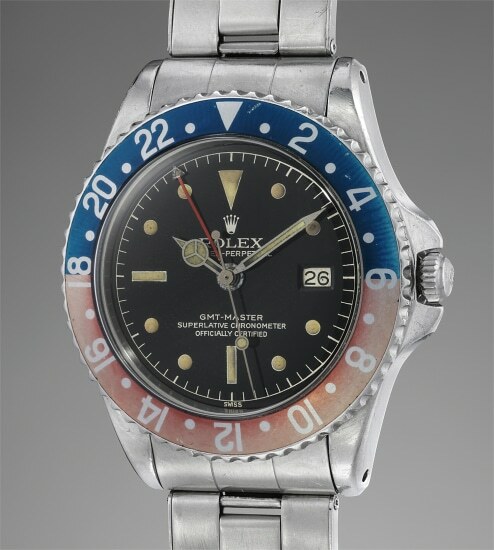 Overall, the result is a magnificent specimen of an early 1675, and with its good looks and complete nature, should stir the pulse of any collector of vintage Rolex sports watches.